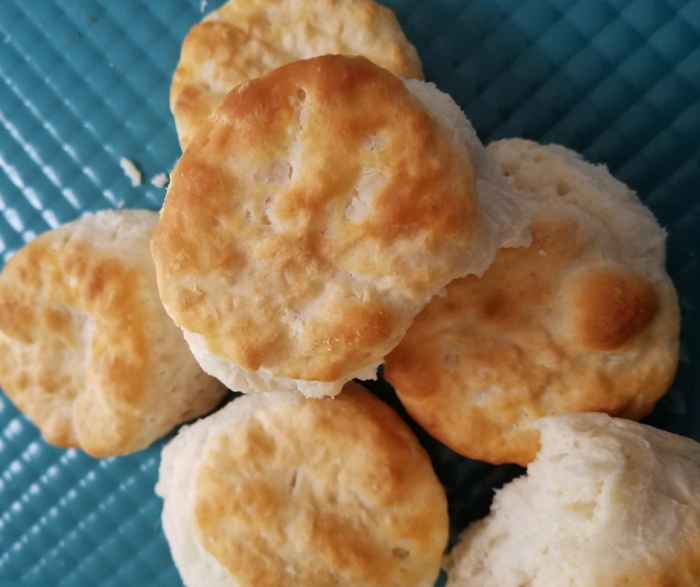 I’ve been playing with variations on this Healthy Biscuit Recipe for a while now, and finally came up with one that I can enjoy. It’s hard to find a way to make this southern classic comfort food healthier, but the addition of nonfat Greek yogurt really seems to do the trick! No biscuit is truly healthy considering the basic carbs, but this is much healthier than other choices. The lack of butter in this recipe helps make it a much better choice that you’ll still enjoy but won’t feel so guilty about enjoying. I love having these with sugar-free strawberry jam or unsweetened apple butter. 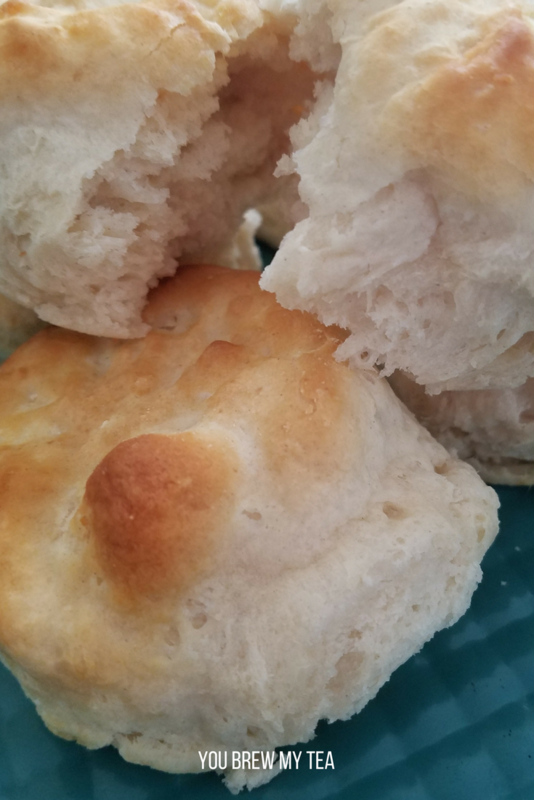 Such a great option that makes this healthy biscuit recipe a favorite! Spray a baking sheet with non-stick spray or line with a silicone baking mat and set aside. In a large bowl, mix together flour, salt, baking powder, Greek yogurt, and club soda. On a clean surface, sprinkle a bit of flour to coat the area, then turn out dough onto floured surface. Pat or roll out to 1/2″ thickness and using round biscuit or cookie cutter, cut into biscuits. Roll any remaining dough out again to make as many biscuits as possible. Should make 12 medium biscuits. Place biscuits on the baking mat, touching each other. Brush the tops of the biscuits with melted butter. Place in oven and bake for 15-18 minutes or until golden brown on top and cooked through. Pat or roll out to ½" thickness and using round biscuit or cookie cutter, cut into biscuits. Roll any remaining dough out again to make as many biscuits as possible. Should make 12 medium biscuits. Place in oven and bake for 15-18 minutes or until golden brown on top and cooked through. May brush remaining butter on top if desired. 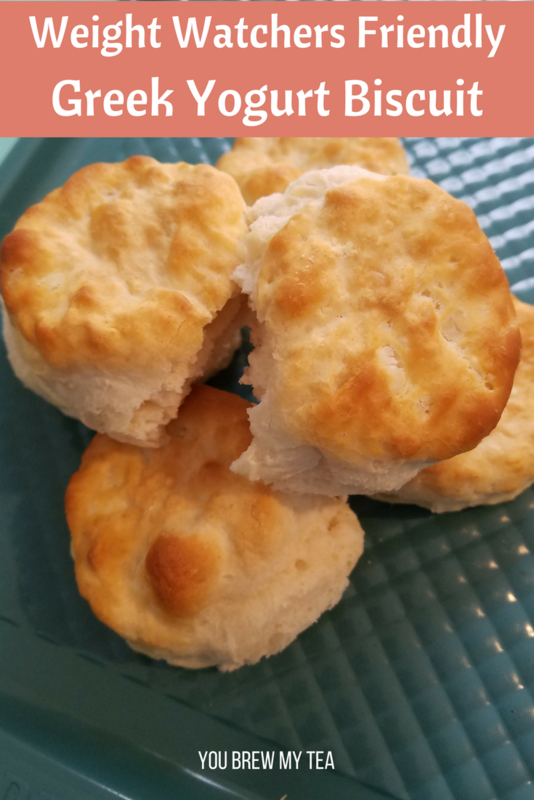 Making this healthy biscuit recipe to go with any number of our favorite meals is easier than ever! Since it is Weight Watchers friendly, it’s a great option for any meal plan! If you are new to Weight Watchers, check out our tips on the Weight Watchers FreeStyle and Flex Plan Updates, as well as making sure you check out our One Week FreeStyle Weight Watchers Menu Plan and Vegan FreeStyle Weight Watchers One Week Menu Plan for more meal planning ideas. Are these Healthy Greek Yogurt Biscuits 2 Freestyle pts plus or 3 as it says in printable recipe? Isthere any substitute for club soda? You can use sparkling water, club soda, seltzer water, or diet 7up. Could anyone tell me how these would work with Slimming World? Would they be a Free food? Or a Healthy Extra? or would there be a Syn value? Can u use self rising flour? Thanks for the recipe! Made these last night but they were very dense. Not sure what I did wrong. Any suggestions? 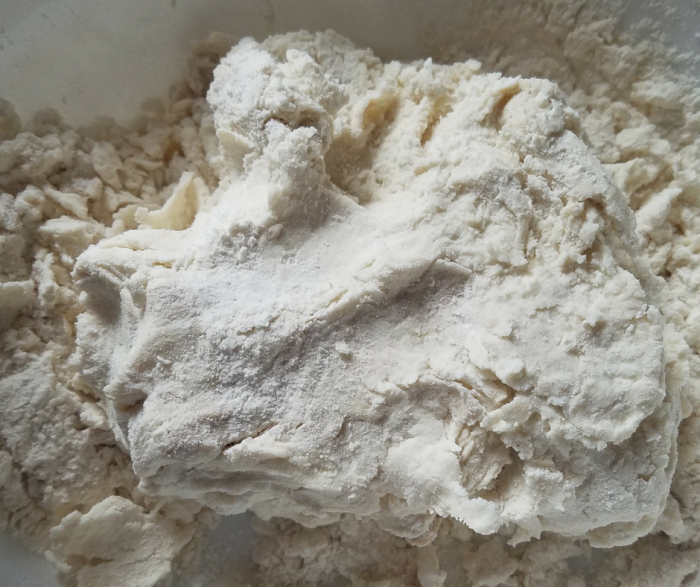 Some prefer using self rising flour instead of the flour, baking soda, salt mixture. Others have added more baking soda. I also found them to be firm and they didn’t raise particularly high. I realized too late that I did not place them on the baking sheet touching each other. I assume this might help them rise higher. The recipe calls for baking powder but here you are referring to baking soda. Did you mean powder? Or is there supposed to be baking soda in the recipe? Is there something I could substitute the butter with? You can leave it off if you prefer. It simply helps brown the tops and adds a bit of flavor. Any idea how well these would freeze or how long they last? They freeze great. I have made them into sandwiches and also frozen just by themselves. I would say if wrapped well 4-6 weeks they would be fine.Possibly longer. They are delicious! Thanks for the recipe. I made m8 i ones that were only one point each…this time I’ll make regular sized biscuits! Can you use almond flour? Would you still add the baking powder and salt? 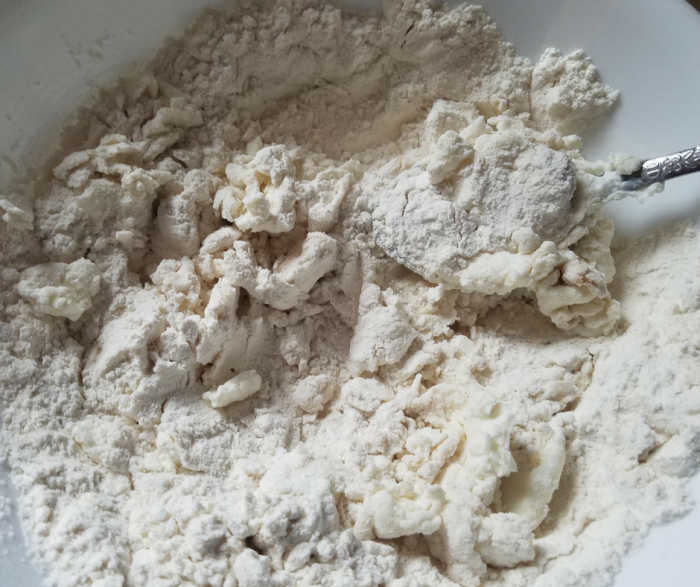 Almond flour will result in a much higher point value for the biscuits, and since I have not made them using it, I am honestly unsure how they would turn out.